Another soul saved from the horrors of bot-aspirancy by The Order! 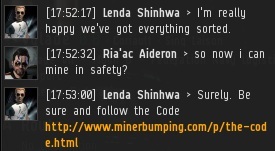 Who says The Order doesn't care about miners?!? Next episode Ria doesn't get SRP because the gank was before he was a permit holder. He then proceeds to call everyone faggots and gets back on the red pen list. So basically, your extortionists; or I shall say, a cartel? "Extortion (also called shakedown, outwresting, and exaction) is a criminal offense of unlawfully obtaining money, property, or services from a person, entity, or institution, through coercion." 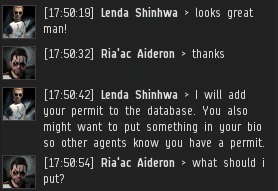 there is nothing illegal or criminal about what we do or ccp would ban all of us. please look up the definition of the words you are using before using them. Beating a guy up until he spit the cash is called extortion in my country. Mafia and cartel are quite good at doing it, from this day on shall I call you the the New Cartel of Highsec? "Making a threat of violence which refers to a requirement of a payment of money or property to halt future violence is sufficient to commit the offense." you dont have to pay the money. it is your free will what you do. also we do not threaten anyone, we just use mechanics that the game gives us. also it is discutable if blowing spaceships up is even violence, or more likely a very important service to the eve economy. 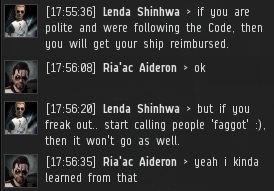 it would be extortion if we as a group would only get the benefits when enforcing the code, but we are doing a community service for all of highsec, show me one "mafia, thug" etc. who does this business to serve the greater good...correct there is none. so go back playing solo games if you cannot live with the decision of thousands of players, because you think your opinion is more worth than any others. It is pretty obviously extortion, and you do clearly threaten. Don't pay too much attention the notion of illegality. 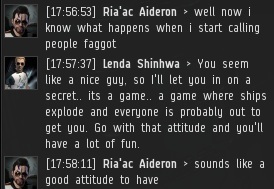 Random violence and murder are also illegal in (most of) the real world, and CCP doesn't ban for those things either. All that said, this is adorable, and while the brainwashed cultist theme is a bit much, I say: Keep fighting the good fight, guys. You must actively play eve for you read blogs and forums, so you're not a human in a sweat shop, or a human that goes shopping when docking their exhumer at the nearest mining belt. Think about what all those bots mean to your bottom line. Oh.. I'm sorry you're not a miner - that's okay think about those minerals that come from botters and ask yourself is that fair? 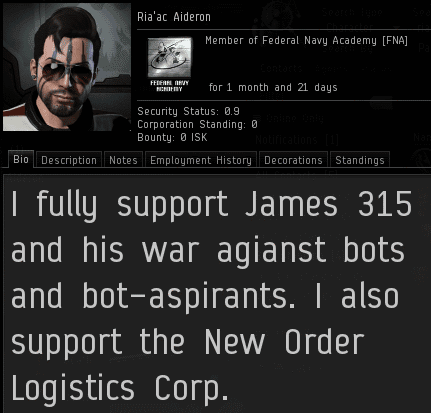 Support the New Order for they are trying to make empire bot free and full of human interaction. Read past the spin and understand it's about defeating apathy - apathy towards the nasty mining mechanics and the insane combat rules that exist in empire. @Anonymous 8/29 12:33: Then perhaps you could establish the New Order Intelligence network, providing locations of suspected botting operations? Such information would be of great value to Knights of the New Order. This story had a very nice happy ending, and I hope Ria'ac passed the ultimate test! His ultimate test will be ganking along side CODE members. But will he be up for the task at hand? That remains to be seen.